La Aroma de Cuba cigars are always a delight to smoke. Whether you are picking up an award winning Mi Amor Belicoso or a delectable Edicion Especial, you know the experience is going to be extraordinary. For those of you who haven’t smoked a La Aroma, it’s never too late, and what better way to first smoke a cigar than with a proper tasting event! We will be having a series of seminars with Rex, one at each location in the next month and a half. 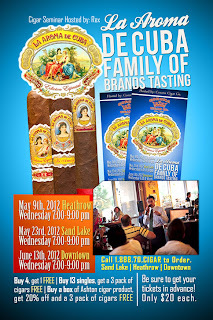 Rex will be introducing you to the La Aroma family of cigars, and teaching proper tasting techniques along with beverage pairings for his cigars. Even a seasoned smoker leaves with more smoking knowledge each time they go to a seminar with Rex. 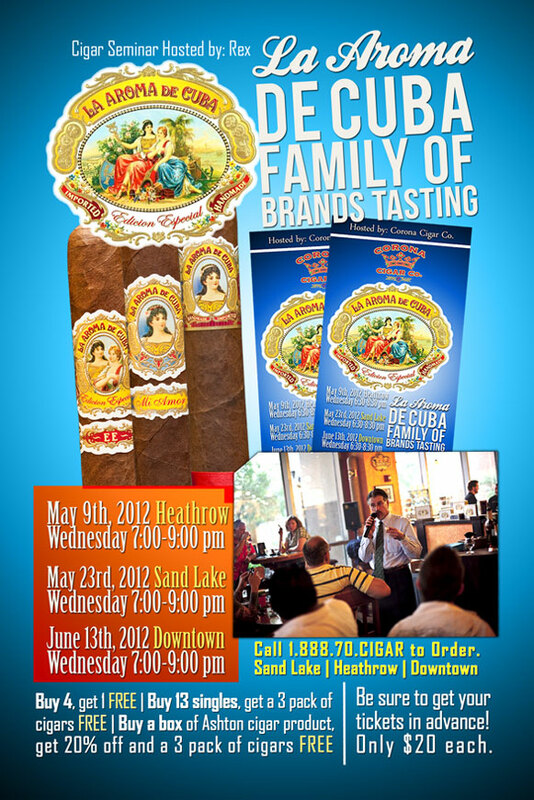 You can expect to see plenty of Corona Cigar employees there learning from one of the best and having a great time. There will be plenty of specials on La Aroma cigars, so make sure to buy your ticket in advance for the date that best suits you! Rex will be at the Heathrow store Wednesday, May 9th from 7:00 PM to 9:00 PM; Sand Lake May 23rd from 7:00 PM to 9:00 PM; and Downtown June 13th from 7:00 PM to 9:00 PM.